The following data comes from a combination of the officially-licensed V Jump Books Hacker's Memory guide, translating from Japanese to English, and from direct evaluation of the Japanese and English games. 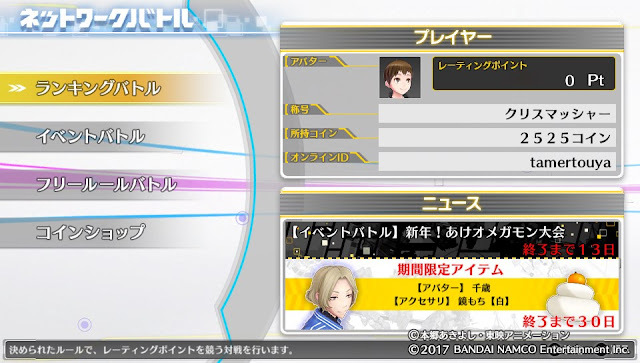 No Digimon stats were changed in the transition between Cyber Sleuth and Hacker's Memory. 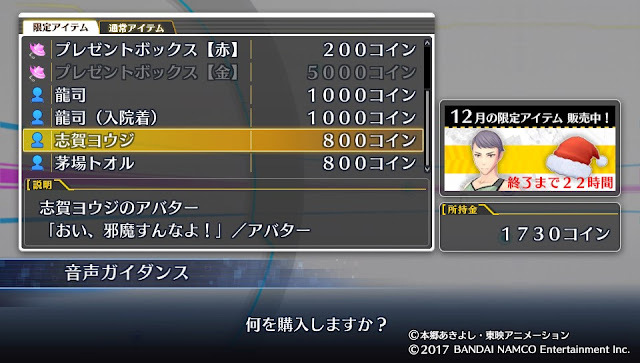 Instead, changes were made to all three Skill types, Inheritable, Special, and Support, as well as to equipment slots. Certain Digimon have had SP costs reduced for some Specials, their chance of inflicting secondary effects increased, or even entire abilities replaced. 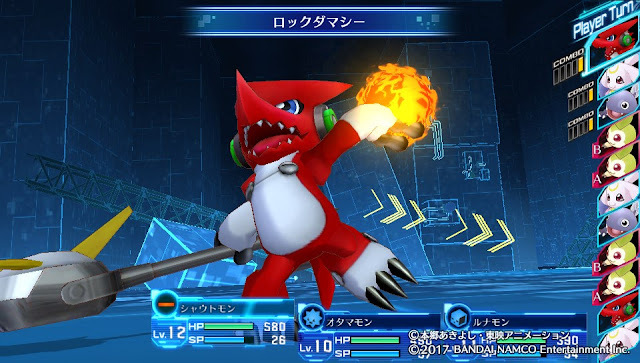 This list only covers changes to existing Digimon, not new Digimon introduced in Hacker's Memory, and focuses on Perfect, Ultimate, and Super Ultimate-level Digimon. The Neutral Inheritable Skills (Power Energy/Heavy Strike/Mach Rush) now have the "Always Hits" property, ensuring that every Digimon can now have a counter to evasion-based strategies. On status effect duration; Confusion ends after 2~4 turns, Paralysis after 3~5 turns, Sleep after 1~3 turns, Stun after 1 turn, Poison after 3~4 turns, and Dot after 2~4 turns. Support nullification after 5 turns. All status buffs end after 5 turns, while all counter skills end after 3. Digimon can now act on the same turn that they wake up from Sleep. 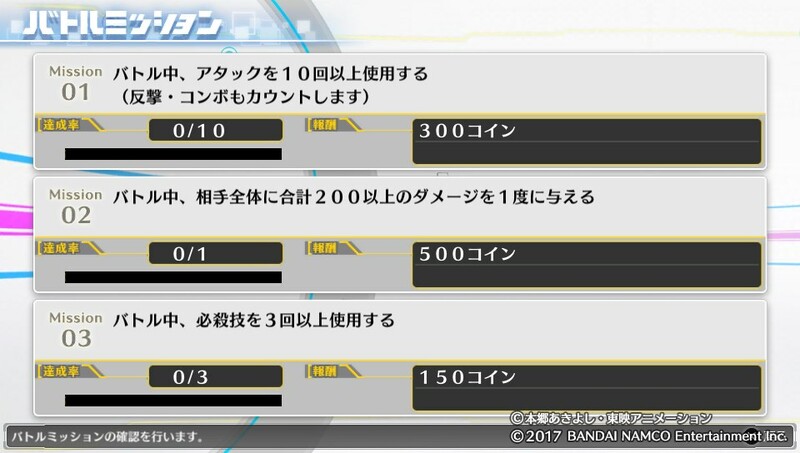 The maximum Ability is now 200, rather than the 100 of the first game. This puts the maximum number of bonus stats at 150. 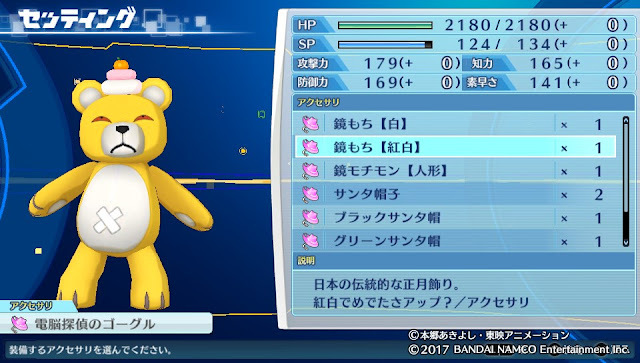 Most Digimon with standard damaging Specials have seen either a +5 or a +10 buff to that Special's base power. A few examples can be seen under "Special Skill changes." Unless otherwise mentioned below, any Special Skill that inflicts a status effect has now had its probability to inflict it raised or lowered to make that probability exactly 40%. Dispel and Restore now cost 25 SP rather than 8. This serves to more strictly limit one of the most popular strategies from the late Cyber Sleuth's metagame; using Dispel to shrug off the Attack decrease incurred by using Shine Greymon: Burst Mode's Final Shining Burst. Seven of the status error moves have been reduced to 70% accuracy instead of 100%: Texture Blow, Panic Wisp, Shock, Venom Trap, Idle Bubble, Ripping Net, and Character Reverse. Support End is the only status move to retain 100% accuracy. #324 Magnamon's Miracle now has a 10% chance of reducing damage by 75%, instead of reducing damage by 30%. 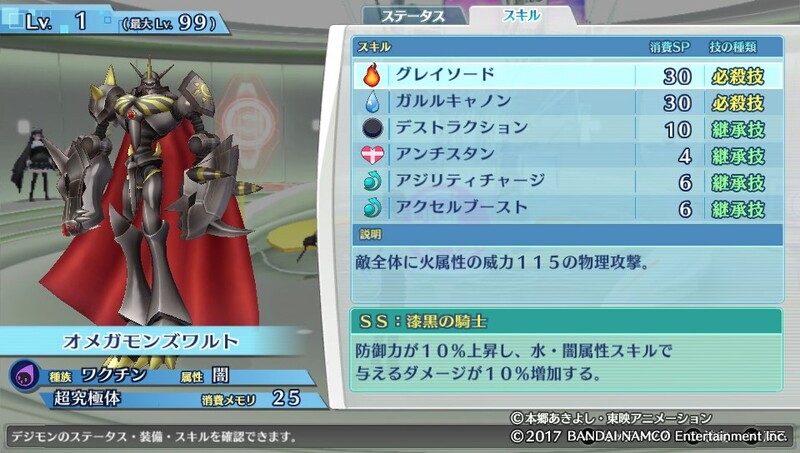 #219 Alphamon's Hermitic Loner now increases the damage dealt to Royal Knight Digimon by 50%, instead of 20%. This puts it on a level playing field with the new Counterattack, Armagemon's Support Skill. #249 Shine Greymon: Burst Mode's Shining Burst now increases the damage the party receives from magical attacks by 50%. Previously the Support increased the damage from Dark-attribute attacks by 25%. 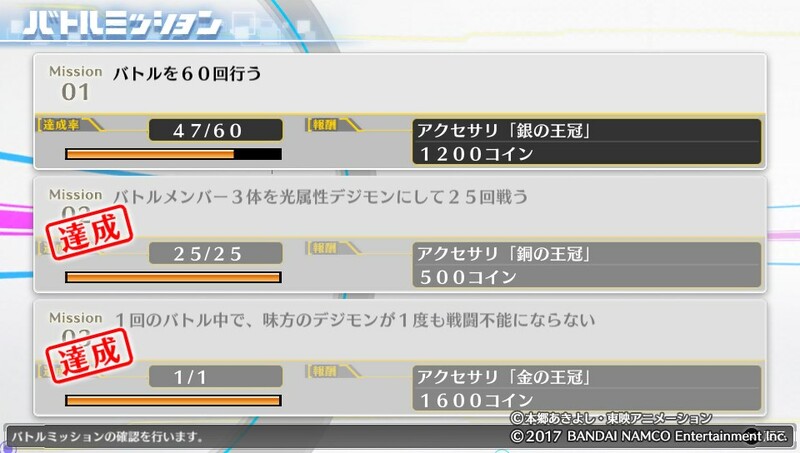 The Attack increase from the Skill is still only 25%. This is likely in reaction to how overwhelming Burst teams were late in Sleuth's life. #150 Aero V-dramon & #220 Ulforce V-dramon's Swiftness now only affects the user. #168 Skull Greymon's Oblivion Bird now has a 50% chance to reduce the target's Defense by 10%, instead of a 30% chance. #191 Black King Numemon's Dark Pupil now has an 80% chance to inflict Poison, not 20%. #192 Blue Meramon's Cold Flame now always buffs their Intelligence by 10%, rather than having a 10% chance to do so. #200 Mega Seadramon's Lightning Javelin now has an added 40% chance to Paralyze. #205 Metal Tyrannomon's Nuclear Laser now always increases their Defense by 10%, instead of having a 30% chance to do so. #207 Monzaemon's Lovely Attack/Hearts Attack was originally a Piercing Neutral Special that ignored the target's Intelligence and had a 10% chance to Stun. Its cost has been reduced from 30 SP to 20, and it has been changed into a restorative Special that heals one ally for 50% (singleplayer) or 10% of their maximum HP (multiplayer) and increases their Attack, Defense, and Intelligence by 10%. #211 Rapidmon (Perfect)'s Golden Triangle now has a 10% chance to increase all of their base stats by 10%, instead of a 5% chance to do so. #212 Lilymon's Flow' Cannon/Flower Cannon now has an added 50% chance to Paralyze. #213 Lucemon: Falldown Mode's Dead or Alive has had its base power increased by 20. #216 Were Garurumon (Black)'s Engetsugeri/Full Moon Kick now always increases his Speed by 10% instead of having a 10% chance to do so. 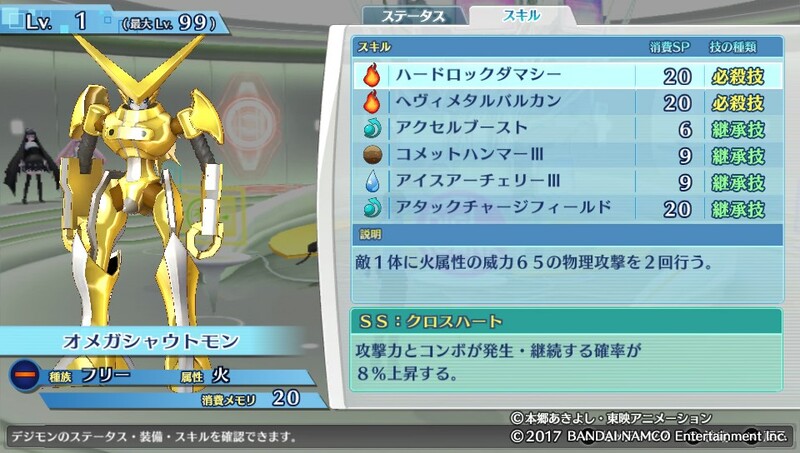 #219 Alphamon's Seiken Grandalpha/Blade of the Dragon King has been changed to a single 150 physical Light-attribute hit to one enemy. Formerly it dealt 3~6 Light-attribute physical attacks to one enemy, with each hit having a base power of 30. #220 Ulforce V-dramon's Shining V Force/The Ray of Victory now always increases their Speed by 10%, instead of having a 10% chance to do so. #221 EBEmon's Brain Rupture has had its chance to inflict Confusion raised to 50%, from 20%. #227 Venom Vamdemon's Venom Infuse/Venom Infusion has had its chance to inflict Poison raised to 50%, from 30%. #228 War Greymon's Brave Tornado/Great Tornado now says it deals "large" damage rather than "double," and the attribute has been changed from Fire to Neutral. #230 Gaioumon/Gaiomon's Rinkazan/Will-'O-Wisp Slash now deals two 70-power hits, not 65. #236 Kuzuhamon's Taizoukai Mandala now always hits regardless of accuracy. The cost of #237 Gran Kuwagamon's Dimension Scissor has been reduced from 40 SP to 35 SP, and it now deals "large" damage, not "double." Further testing needed. #242 Cherubimon (Vice)/Kerpymon (Black)'s Lightning Spear now deals "large" damage, not "double." Further testing needed. #249 Shine Greymon: Burst Mode's Final Shining Burst now decreases their Attack by 50% after use, instead of 10%, and its accuracy has been reduced to 90%. #250 Justimon's Justice Kick has its probability to buff all stats by 50% raised to a 5% probability, from 1%. #257 Titamon's Konpaku Shingeki/Soul Core Attack has had its SP cost reduced from 40 to 30, and now deals "large" damage rather than "double." Further testing needed. #259 Dianamon's Good Night Moon has had its base power reduced from 125 to 120, and its chance to inflict Sleep reduced from 100% to 50%. #262 Dukemon's Royal Saber/Lightning Joust has had its chance to increase Defense by 10% raised to a 50% probability, from 30%. #263 Dynasmon's Dragon's Roar now deals two hits of 60, not two hits of 55. #265 Duftmon's Ernste Welle/Black Aura Blast now decreases the opponent's Defense by 20% instead of 10%. 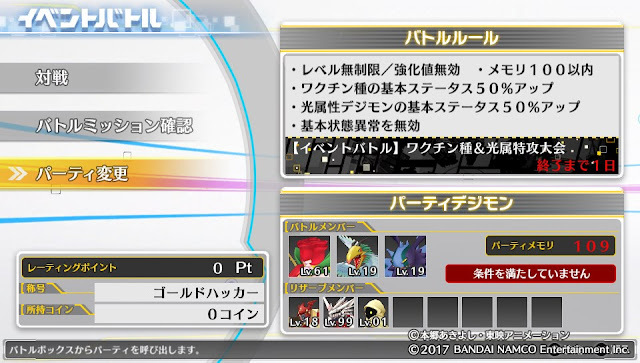 #272 Banchou Leomon's Flash Banchou Punch/Flashy Boss Punch has had its chance of inflicitng Stun reduced from 75% to 50%. #273 Piemon's Trump Sword now inflicts the Support End status error. #274 Pinocchimon's Bullet Hammer/Puppet Pummel has had its chance of incliting Stun raised to 50%, from 25%. #276 Black War Greymon's Dark Gaia Force/Dark Terra Force now decreases the opponent's Attack by 20% instead of 10%, and Black Tornado deals "large" Dark-attribute damage, not "double." Further testing needed. #277 Prince Mamemon's Smiley Warhead/Smile Warhead has had its base power reduced to 110, from 130. In exchange, it now always inflicts Knockback. #280 Herakle Kabuterimon's Giga Blaster now has a base power of 130, not 120. #282 Beelzebumon: Blast Mode's Chaos Flare/Corona Destroyer now deals "large" Dark-attribute damage, not "double." Further testing needed. #283 Belphemon: Sleep Mode's Eternal Nightmare now deals "medium" Dark-attribute damage. Further testing needed. #285 Holydramon's Holy Flame/Fire Tornado now has a base power of 95, formerly 80. #297 Metal Garurumon has lost the Garuru Tomahawk Special, which has been replaced by Cocytus Breath. Cocytus Breath costs 20 SP, deals 115 Water-attribute magical damage to a single target, and has a 25% chance to Paralyze. #298 Metal Garurumon (Black) retains the Garuru Tomahawk Special. #299 Metal Seadramon's Ultimate Stream/River of Power now has a base power of 130, not 120. #301 Rust Tyrannomon's Terrors Cluster now has a 50% chance to inflict Paralysis, not 25%. #303 Lilithmon's Phantom Pain now deals "heavy" damage, not "triple." Direct testing demonstrates that the exact multiplier for her Intelligence is now 2.5x instead of 3x. #306 Lord Knightmon's Argent Fear/Fist of Athena has had its SP cost reduced from 50 to 40, and deals "heavy" damage not "triple." (Same wording as the new Lilithmon.) Further testing needed. 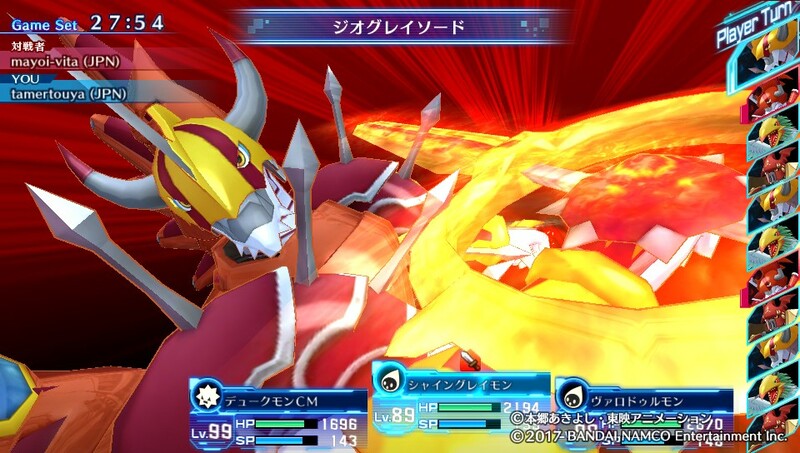 #313 Imperialdramon: Paladin Mode has had its chance to inflict Dot raisedto 30%, from 10%. #314 Examon's Pendragon's Glory now deals 145 Wind damage rather than 135. #315 Omegamon's Garuru Cannon/Supreme Cannon now deals "large" Intelligence-Piercing Water-attribute damage to one foe. Previously it dealt 130 Water-attribute magical damage to a single target; the old version of the Special is retained by Omegamon NX. #316 Omegamon Zwart's Garuru Cannon/Supreme Cannon is the same as the new Omegamon's. 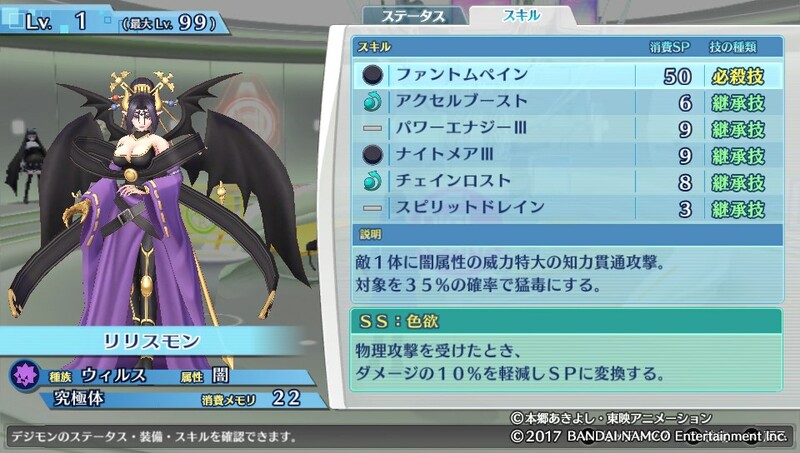 #321 Belphemon: Rage Mode's Gift of Darkness has had its SP cost reduced from 60 to 40, and now deals "heavy" Dark-attribute damage to one foe, not "triple." (Same wording as the new Lilithmon.) Further testing needed. #322 Lucemon: Satan Mode's Divine Atonement has had its SP cost increased from 30 to 50. It now deals 200 magical Light-attribute damage to all foes, and decreases the user's Intelligence by 50% if it hits. Its accuracy has been reduced to 90%. Previously it dealt 105 Light-attribute damage to all foes. #323 Fladramon's Knuckle Fire/Flaming Fist has had its base power increased to 70, from 50. #324 Magnamon's S-Gold Solar Storm now increases their Defense by 15%, formerly 10%. #325 Rapidmon (Armor)'s Golden Triangle now has a 20% chance to increase all of their basic stats by 10%. Previously the description stated it always worked. 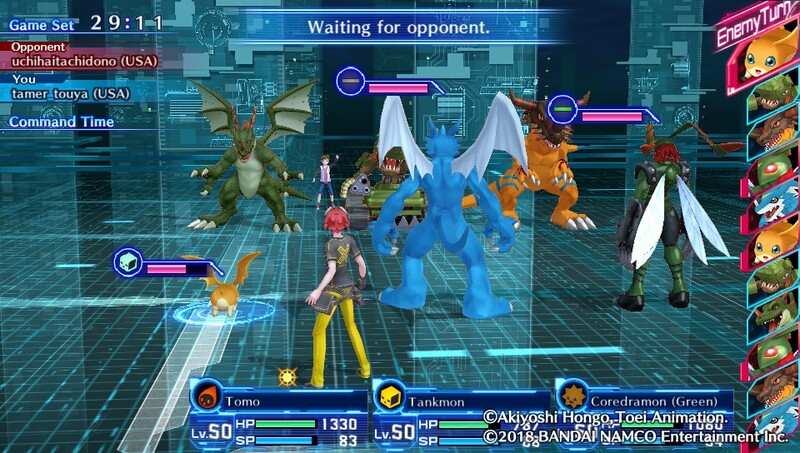 Atlur Kabuterimon, Aero V-dramon, Zudomon, Whamon, Monzaemon and Magnamon are unchanged from the previous game. All of them have 2 slots except for Aero, who has 1. 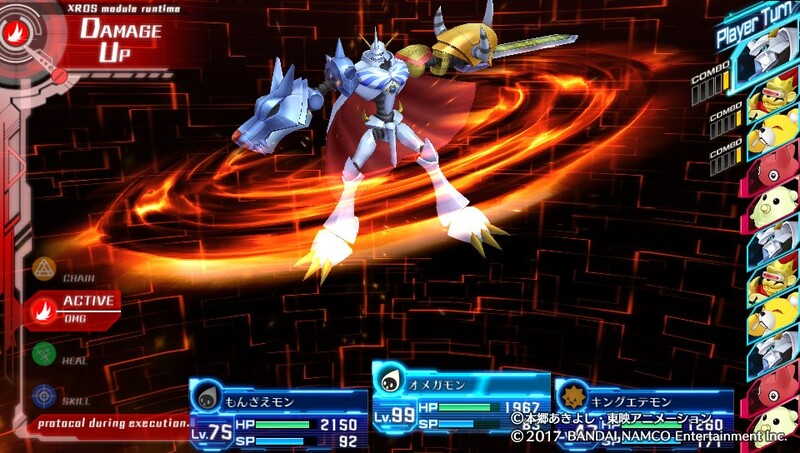 Cyberdramon, Metal Greymon, Metal Greymon (Blue) and Lucemon: Falldown Mode all gained another slot, putting them at 2. Garmmon and Omega Shoutmon are newly introduced, but only have 2 slots. In kind, many of the Ultimate and Super Ultimate-level Digimon have 3 equipment slots in Hacker's Memory. The following 56 Digimon have less than 3 equipment slots. 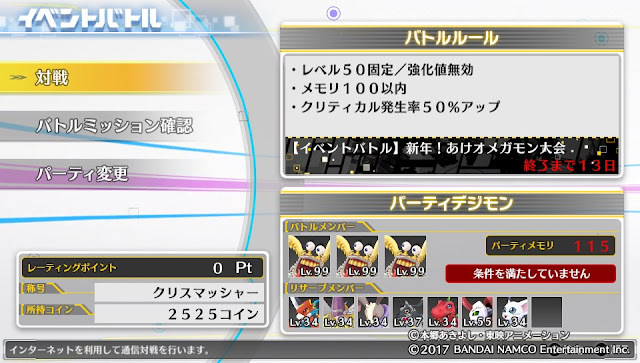 Arkadimon Ultimate, Alphamon, Ulforce V-dramon, Chaos Dukemon, Craniummon, Sleipmon, Dukemon, Beelzebumon, Belphemon: Sleep Mode, Mastemon, Leviamon, Armagemon, Alphamon Ouryuuken, and Susanoomon have 1 slot. Imperialdramon: Dragon Mode, Imperialdramon: Fighter Mode, Valdurmon, War Greymon, Ophanimon, Kaiser Greymon, Chaosdramon, Gankuumon, Gran Dracmon, Cherubimon (Virtue), Goddramon, Jesmon, Shine Greymon, Shine Greymon: Burst Mode, Slayerdramon, Seraphimon, Tyrant Kabuterimon, Diablomon, Demon, Dynasmon, Durandamon, DORUgoramon, Neptunemon, Pile Volcamon, Barbamon, Black War Greymon, Breakdramon, Beelzebumon: Blast Mode, Holydramon, Megidramon, Mercurymon, Lilithmon, Ravemon: Blast Mode, Lord Knightmon, Arkadimon: Super Ultimate, Imperialdramon: Paladin Mode, Examon, Omegamon, Omegamon Zwart, Dukemon: Crimson Mode, Belphemon: Rage Mode, and Lucemon: Satan Mode. The remaining 50 Ultimate and Super Ultimate-level Digimon have 3 slots. The fortnightly "event battle" page, which currently hosts rules allowing only Digimon of Adult level or lower. 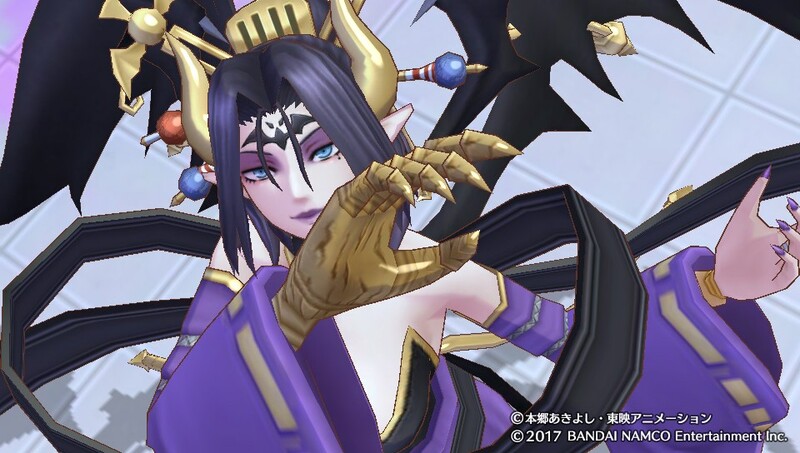 With the international launch of Digimon Story Cyber Sleuth: Hacker's Memory on PlayStation 4 and Vita over January 19th, the English-speaking world has been brought into the fold of the ongoing Adult Digimon tournament that began in Japan earlier this month. The revelation comes as a surprise to some, as the most recent tournament has been themed around Japanese New Year's. In light of the culturally-specific Kagami Mochi accessories being the primary multiplayer reward, and the event itself already being several days in-progress, up to now it was not unthinkable that English-speaking territories would have their own separate track of events. 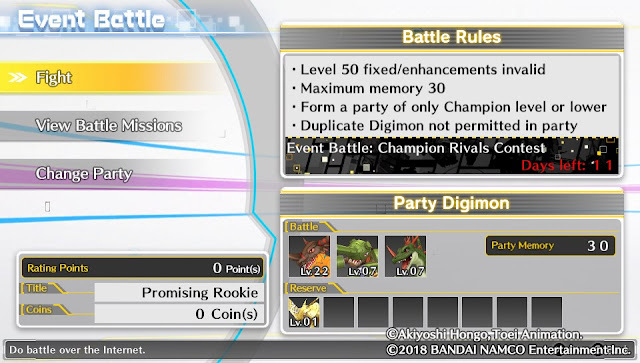 The current event is fairly easy to jump into, as bonus stats are ignored, the Memory limit is a paltry 30, and it only requires relatively lower-end Digimon compared to the main Ranked mode. Thus the headstart from getting the game early doesn't confer nearly as much of an advantage on Japanese Digimon tamers, making the current theme ideal for westerners to join in on. The title "Crack Team," named after the group in Digimon's base canon, has been mistranslated as "Crank Team." This could be from a misreading of クラック Kurakku as クランク Kuranku. The title "Hypnos," named after the NSA-like espionage organization in Digimon Tamers, has somehow become "Hypnotizer." The title "Xros Heart General," named after Kudou Taiki's title in Digimon Xros Wars, was rendered as "Cross Heart General." Something similar happened with a tutorial on the Xros Combo mechanic back in Cyber Sleuth. Note however that Xros is presented correctly on the same page of the shop, in the title "Xros Wars." Though not a title, the Kagami Mochi hats were left as-is while the Kagami Mochimon hat was rendered literally as "Mirror Motimon," seemingly not picking up on the pun. 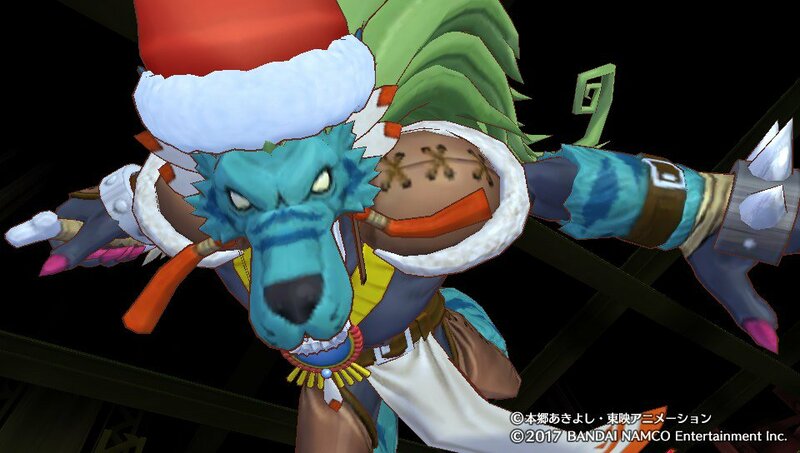 On a localization note, while the "Crest of Purity" has been made into the "Crest of Sincerity" and "Crest of Honesty" into "Crest of Reliability" in accordance with the Digimon: Digital Monsters English dub, curiously the titles not associated with the first season do not use their localized equivalents. The title "Wild Bunch" would normally be replaced with "Monster Makers" to match the English dub of Digimon Tamers, yet goes untouched; in kind, "The Best Bancho" would ordinarily be translated as "The Best Street Fighter," "Cross Heart General" would be rendered "Fusion Fighter General," "Twilight General" would become "Midnight General," and "Death General" as "Dark General." Instead these titles have all been left alone in translation, and the titles that refer to the individual works by their Japanese names (Adventure, Tamers, Frontier, Savers, Xros Wars, X-Evolution) have likewise remained the same. 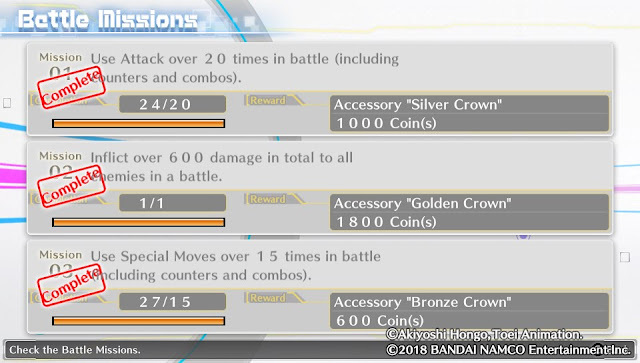 The current Battle Missions remain identical to their Japanese counterparts, with the reward for fully clearing all three being a King's Crown as was the case in previous tournaments. "INT-penetrating attack, heavy Dark damage to one foe. 35% chance of poisoning target." "Reduces damage received from physical attacks by 10% and converts it to SP." Evolves from Lilamon and Lady Devimon. Cannot evolve further. "INT-penetrating attack, triple Dark damage to one foe. 35% chance of poisoning target." Direct testing demonstrates that Phantom Pain deals damage equal to 2.5x Lilithmon's Intelligence, rather than 3x as was the case in in Cyber Sleuth. One aspect not described in the text is that Phantom Pain has a heavier cooldown than most Skills, in multiplayer delaying Lilithmon's turn by more than ten turns in the timeline. (i.e. 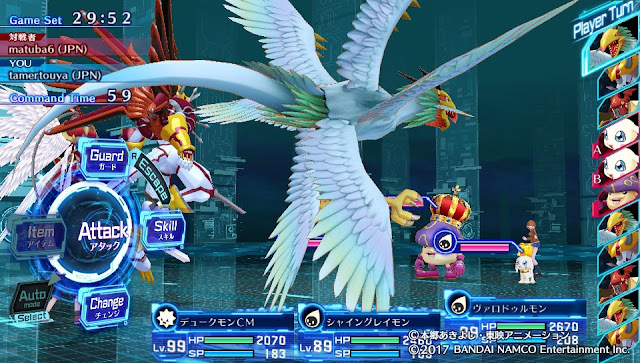 all of the opposing Digimon move, then all of Lilithmon's allies move, then all of the opposing Digimon move, then Lilithmon gets a turn along with her allies.) For comparison, standard Attack and Guard commands have a five-turn delay, and tier III Inheritable Skills have an eight-turn delay. 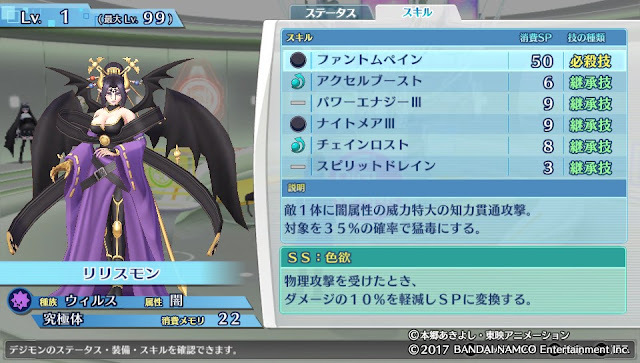 On the other hand, Lilithmon now has two accessory slots rather than just one. "2 physical attacks, 65 Fire-attribute damage to one foe." "100 physical Fire-attribute damage to all foes." "Raises Attack and combo chance by 8%." Evolves from Shoutmon. Cannot evolve further. Reflecting his higher Memory cost, Omega's stats are on par with other fully evolved Digimon. 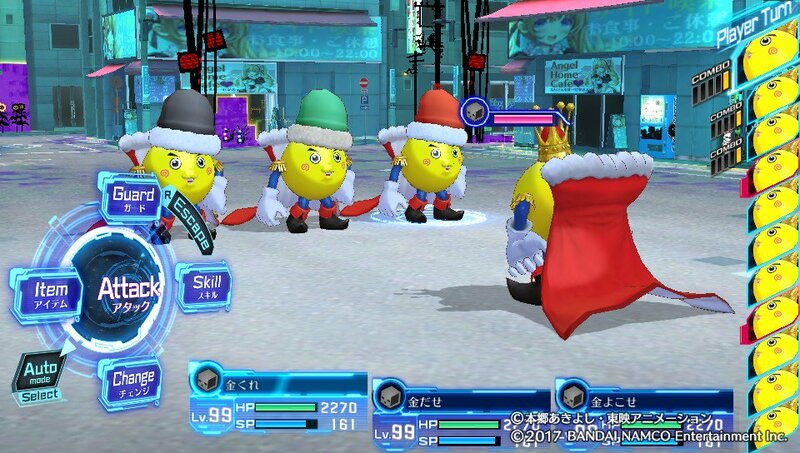 (They compare favorably with King Etemon.) The only thing worryingly low is Intelligence, which is barely higher than Megidramon's. Heavy Metal Vulcan is point-for-point stronger than War Greymon's Gaia Force, and Hard Rock Damashii is completely identical to Gaioumon's Rinkazan. "Physical attack, 115 Fire damage to all foes." "INT-penetrating attack, heavy Water damage to one foe." "Increases SPD by 10%, and damage from Fire and Light skills by 10%. Evolves from a Jogress of War Greymon and Metal Garurumon. Cannot evolve further. "Increases DEF by 10%, and damage from Water and Dark skills by 10%." Evolves from a Jogreess of Black War Greymon and Metal Garurumon (Black). Cannot evolve further. "130 Fire-attribute physical damage to one enemy." "Magical attack, 130 Water damage to one foe." Decreases the probability of receiving status errors by 30%. Cannot evolve to or from any Digimon. 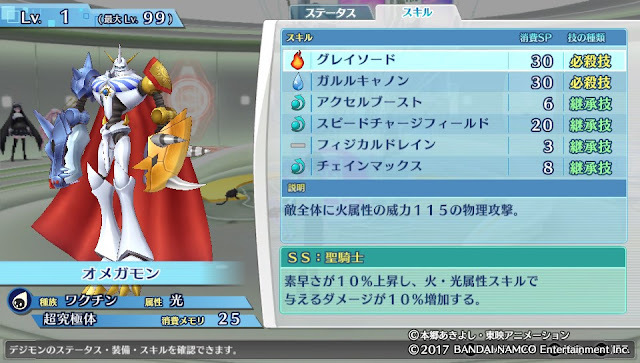 Omegamon NX retains the version of Garuru Cannon used in Digimon Story Cyber Sleuth. The original Omegamon and Zwart have an arguably-better version that pierces Defense but delays Omegamon's next turn in exchange. NXEDGE Style blocks Stun, Paralysis, Poison, Dot/Liquid Crystallization, Sleep, and Bug. 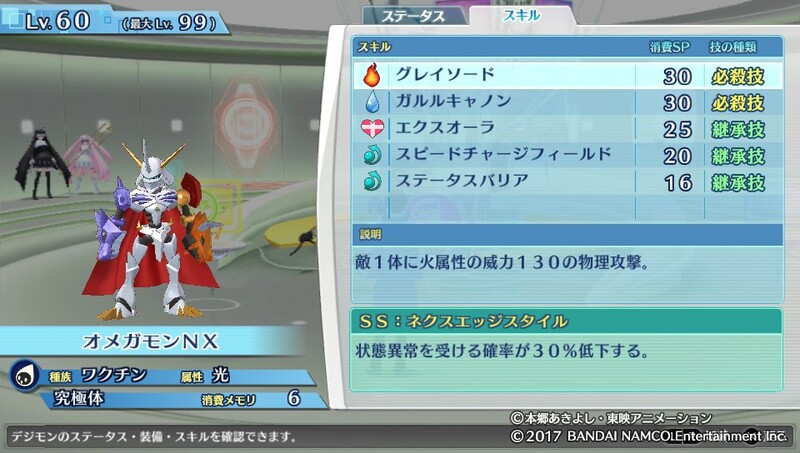 It is different from the NXEDGE Style Skill held by Alphamon NX, Dukemon NX, Lord Knightmon NX, and Duftmon NX. 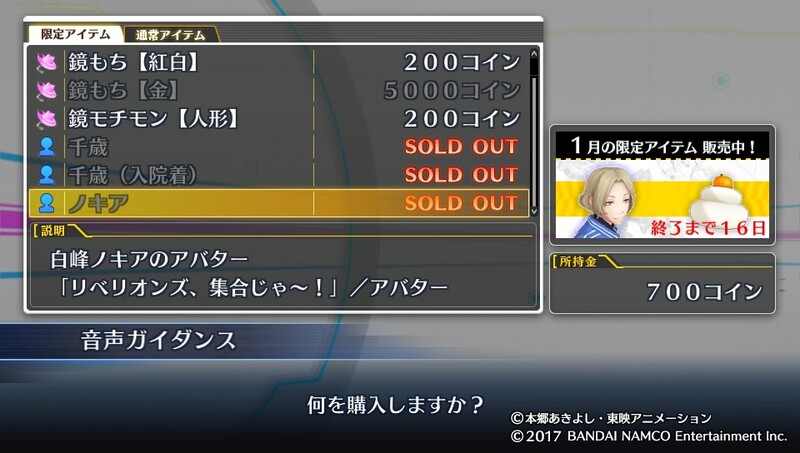 At noon January 1st, 2018, the first event battle for Digimon Story Cyber Sleuth: Hacker's Memory came to a close. 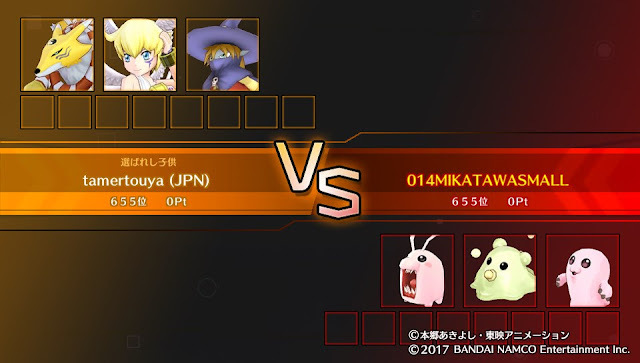 Titled "Vaccine-type & Light-attribute Special Tournament" (ワクチン種＆光属特攻大会 Wakuchin-shu ando Hikari-zoku Tokkou Taikai) the theme of the event was using Vaccine-Light Digimon like Holydramon and Sleipmon. To commemorate the holiday season, the unique rewards available included three different colors of Santa hats, and three colors of present box, any of which players could use to decorate their Digimon for the season. Digimon tamers battled against one another to for coins, then redeemed them in the online shop for the digital accessories. The official coin shop. Both versions of the Ryuji avatar were priced at 1000 coins, while the Youji and Tooru avatars were only 800. The most expensive item in the shop was the Digimon accessory Present Box (Gold), at 5000 coins. The Battle Missions for the month had a combined payout of 5750 coins, supplemented by several titles and accessories. Completing all three earned tamers the "King Crown" accessory. The "King Crown" hat, awarded for clearing all ranks of all Battle Missions. "The three extortion brothers who haunt the Akihabara Mayohiga." Original image & description posted by @Digitamagon. Original image uploaded by @Digitamagon. A rare player-versus-player match on December 31st. While one might expect the final days of the event to be busy, participants say otherwise. Many tamers chose to use the newly-enhanced battle search function to specifically avoid human opponents, selecting "NPC-only" for grinding coins. 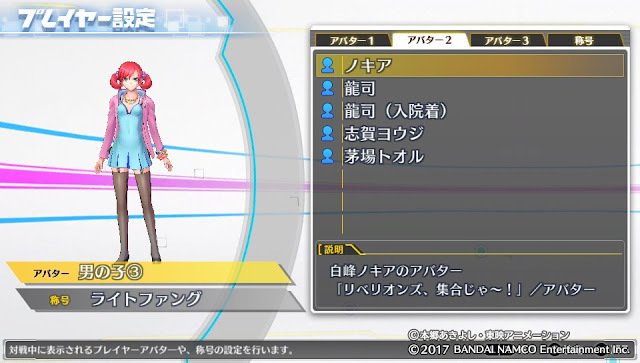 The Cyber Sleuth sub-series' AI are not subject to the same restrictions as human ones, often having impossible stats and strategies that a normal player could never replicate. One such AI currently being used is 017DEBANNSUKUNAI, whose party consists of a single Shakkoumon that always moves first and can deal 4000~6000 damage to the entire party with a single unenhanced Aramitama. Moreover, the payout for fighting these bots is only half of what one gains from playing against humans. But for many tamers this is preferable to matching up against players who had already finished the game, or have a head-start from converting their Cyber Sleuth save data to Hacker's Memory. Well into the second tournament, tamers are still choosing to battle AI opponents rather than play against their peers. The second event battle is "A New Year! 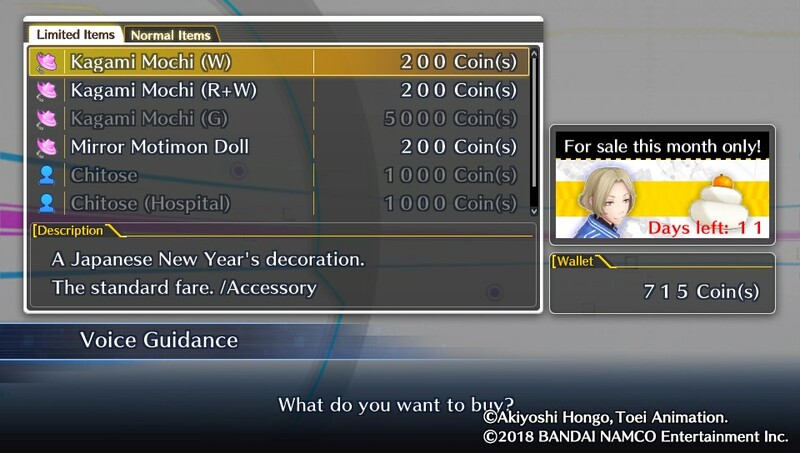 Happy Omegamon Tournament" (新年!あけオメガモン大会) with the theme for both the tournament and the item shop being New Year's celebrations. While many such celebrations take place on New Year's Eve, or on the first day of the New Year, some traditions aren't carried out until as late as the second week of January. 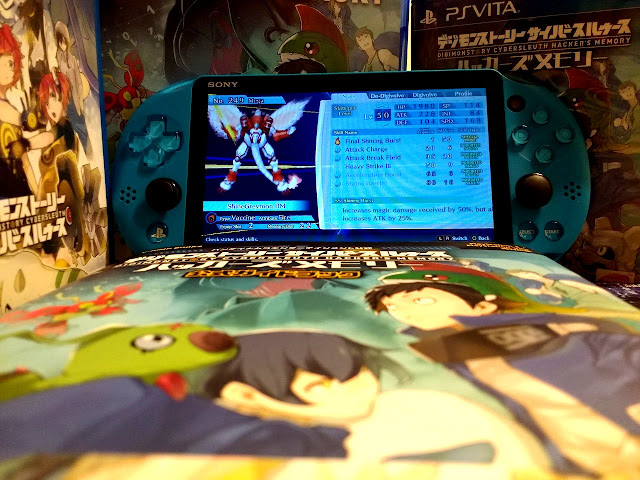 The Omegamon tournament will last until January 15th. The title Shin'nen! AkeOmegamon is based on the traditional expression Shin'nen Akemashite Omedetougozaimasu (新年明けましておめでとうございます) analagous to "Happy New Year." This expression is often contracted to simply Akeome (あけおめ) and from this contraction we get AkeOmegamon. The "Kagami Mochi (White)" hat. The "Kagami Mochi (Festive)" hat. The "Kagami Mochi (Gold)" hat. The "Kagami Mochimon (Doll)" hat. Replacing the present box-shaped hats is a "Kagami Mochimon (Doll)." And replacing Ryuji, Youji, and Tooru, tamers can now purchase two avatars based on Imai Chitose and one based on Shiramine Nokia. The items will remain in the shop until January 31st. The Battle Missions for Shin'nen! Akemashite Omegamon Taikai have a combined payout of 6450 coins, and as in the first event, the prize for clearing all of them is the King Crown accessory. Digimon Story Cyber Sleuth: Hacker's Memory will launch worldwide for the PlayStation 4 and PlayStation Vita January 19th, 2018.